This is the conclusion of a three-part series on the Jan. 6, 1969, sessions for “Two of Us.” If you haven’t already, please enjoy Part I and Part II! George: OK, I don’t mind. I’ll play, you know, whatever you want me to play. Or I won’t play at all, if you don’t want me to play. Whatever it is that will please you, I’ll do it. The line came a little more than 16 minutes into the Let it Be film. In a movie less about words and more about music — the trailer’s promise of “rapping” not withstanding — it would stand out regardless. 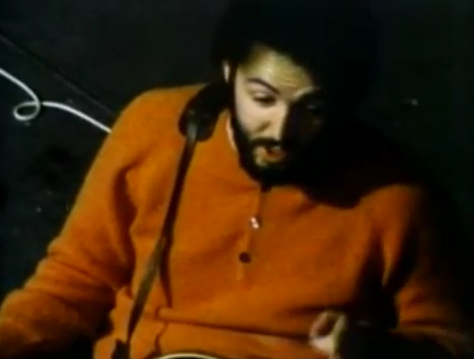 As it is, George’s statement to Paul during the day’s rehearsal of “Two of Us” essentially became the catchphrase for the entire sessions. It’s George’s frustrations and Paul’s bossiness — and John’s disinterest, as he’s conspicuous by his absence — all in one. And because it was in the film, and the highlight of an extensive set of dialogue in it, it’s the moment we point to. At least, it’s the moment I point to. “Whatever it is that will please you, I’ll do it” caps a sequence that lasted much longer than two or so minutes depicted in the film. And when all was said and done, it was Paul needling George over a six-month old suggested guitar part that prompted him to say it (and was the subject of much of the last post). I get what Paul wants to do here, prove his point that a more spartan approach is ideal — especially here while they’re in the rehearsal stage. And he’s made that clear. But instead he finds a way to pick at a scab. George, remember how you were wrong about “Hey Jude”? You’re wrong, just like that, today. And because of George’s state during the sessions — his originals were blandly tolerated at best or outright dismissed at worst — the scab tears right open. George: OK, I don’t mind. I’ll play, you know, whatever you want me to play. Or I won’t play at all, if you don’t want me to play. Whatever it is that will please you, I’ll do it. But I don’t think you really know what that one is. Missing from the film is that last line, which really gives it an extra bite. Passive-aggressive right into aggressive. 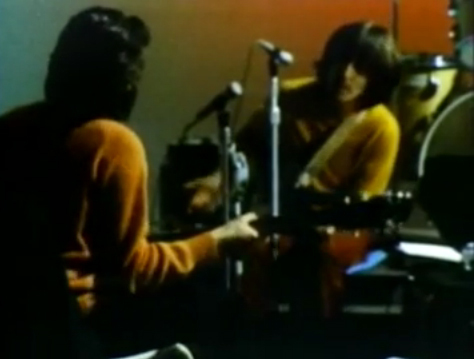 In the film, the discussion pivots from George to John wanting to listen back to tapes before he begins into “Across the Universe.” Paul’s sweater goes from orange to yellow, so not much sleuthing is needed to know that’s cut in from a different day. After George relays his willingness to please, Paul’s actually speechless for a few seconds, before saying, audibly perturbed and in a way only Paul can say it, “OK, now come on.” He pays no mind to John, who here is actually trying to defuse the situation with a resolution that would move the session forward in the immediate. “Do you want to take the galloping bit, and I’ll just vamp?” John cuts in to ask George. Paul continues. Paul (to George): Look, you know, it’s not like that. … We’ve gone through this, we’ve really got to sort out this, because this is the one, you know? Now we’re rehearsing, and we’re trying to get it together for a TV show. So we really, like you said, we’ve only been through four numbers. So we’ve probably got to get some system to get through like 20 or 30 and no more. … And it’s probably going to be like sculpture. So that we get all the chords, so we can all vamp them all. Then we can all play every solo we need. Wow! That’s a lot of songs. What a TV show that could have been, right? (This isn’t the post for it – but it will be sooner than not: What would those 30 songs be?) Anyway! Paul: But… you know what I mean. It’s got to sound as though it’s improving. George: It actually, it sounded to me, that for me, it was a waste of me time playing when we started it today. I just started remembering then what it was getting into the other day after playing it for an hour and a half. And suddenly I start finding that what I’m doing is starting to have something, Have some sculpture to it. Paul: I know what you mean, it’s just that that way of doing it puts me off the way I’m trying to do it. George: But that’s all. I can only do me that one way, however I do it, you know? Silence. And then Paul decides to wave the white flag before being spurned. Just picking his fights, I guess. Paul: Let’s do another song, then. George: No, we can’t. We still have to learn this. Do you want to do … Maxwell’s Silver Hammer? Burn! The sarcasm drips like water from a faucet. Maybe he was looking for an excuse to quit the band a few days earlier than he ultimately did. John: Let’s do this, because, I mean, we’re going to come to this,or whatever it is. And the thing is just to try to and think whatever … it’s going to be. Paul: This afternoon, I think we’ve wasted a long time. I think we do waste, physically, waste a lot of time, the four of us together. It’s Paul as boss again, this time lecturing on employee efficiency. And I don’t blame him, because he’s pretty much on target here. The slate cuts in, and there’s some cross talk and Paul’s bass muffling some dialogue. Paul: I’m scared of that, ‘You be the boss.’ I have been for a couple years. We all have, you know? Not pretending about that. … And that’s what we decided, you know? This line passed right by me the first time I heard it, and it wasn’t until I was sprucing up the post that it jumped out. What’s Paul saying here? Should we give him the benefit of the doubt and guess he’s saying he’s scared of the whole “be the boss” thing for a couple years? Or is he coming out and saying that he has been the boss for a couple years? I’m not sure he doesn’t think of George as a subordinate, but I don’t think he believes that of John. But I’ll give Paul a pass here, in part because the lack of reaction. Paul: Vamping … then get the imaginative thing. … I know it’s impossible … because we don’t do it that way. … There’s no point in me trying to get you to do it how I do it. A little reminder here — they’re not even done with their third day of the sessions, and things are already being described as a “waste of time” and “chaos.” Reading between the lines and maybe I’m off-base, but I think Yoko’s omnipresence is implied as part and parcel of the chaos. And maybe Paul has a bit of an idea that they’re moving too fast here, even though he’s part of that problem — nobody has any idea what songs they’re going to play at a live show, where the show will be or even how it will be staged. Meanwhile, who the heck is Red Norvo? He led his quintet (there was a trio, octet and other combinations, too), playing modern jazz on a vibraphone and, it seems, famously vamping. Paul: It’s terrible, though, seeing yourself really go down a path you’ve been down too many times, you don’t want to go down. Like us going on about this. I really don’t want to go down that path. It’s just silly. I just don’t see any solution. The problem is that we should all arrange our own tunes. And if you want improvisation, then should just say it. George: That’s the best way. Paul: It’s like a point of theory, this, isn’t it? It’s not just to do with playing music. Far further reaching, this thing. Far further reaching, indeed. So the path is set for Beatles 2.0, although we’ve already seen them act, essentially, as each others’ backup band in many instances on the White Album (and certainly before that, too). Now, they discuss codifying it, taking “I’ll play if you want me to play” to its logical conclusion. It wasn’t an angry exchange, this one, rather very matter of fact (and difficult to hear with the band playing over the conversation). But we do see how it manifested on Abbey Road, where the band often recorded parts in separate studios simultaneously. Isn’t this moment here, very specifically, The Beatles agreeing to ultimately break up? They’re happy to relegate the other members as their respective session players, making George no different to Paul than Hamish Stewart, or Paul no different to John than Tony Levin. Perhaps coincidentally, the group launches into a slow, almost mournful abbreviated version with John leading on vocals. Shortly thereafter, Paul gets back to business. The band returned to the back end of the chorus, focusing on timing and cues. Mal is asked to fetch John a tea and George a beer. This can only be a good thing as the occasional brew helps fuel the odd blog post as well. George: It was going heavier. Do you want it more countryish? Paul: I don’t mind, I’ll just go where it goes. The group runs through the song a few times, sometimes able to get all the way through. Tape cuts make it hard to tell just how many times they did work on it. In addition to giving a passing, light-hearted nod to “When the Saints Go Marching In” and “Loop De Loop” — they spent a bit of time on the very end of “Two of Us.” I’d most certainly say Paul was trying to “confuse it” before “unconfusing it” here, but what the hell do I know? I’ve only written about 5,000 words on just 50 minutes of “Two of Us” rehearsals. And with that, we wrap the day’s historic and fascinating rehearsals of the song. 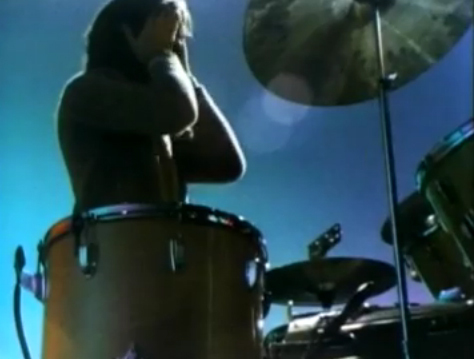 So given the full context of the day’s sessions (and the prior days’, too), and emotions which were especially ramped up during the torturous “Don’t Let Me Down” rehearsal that immediately preceded “Two of Us,” of course George’s famed “please you” wasn’t anything remotely out of the blue. It wasn’t even the most potent or viscous thing he said that hour. But the delivery of “please you” was perfect, and watching it on film more than 40 years later, it’s still a great, dramatic moment. Like I wrote in the first post about “Two of Us,” it’s a passive-aggressive greatest hit. I’ve said it to bosses (they had no idea what I was referencing). I’ve said it to my wife (she did). The pity in all of this? I think the song sounds great. It’s fun, upbeat — I liken it to a driving song during a buddy movie vs. the eventual acoustic cut, which sounds like something to hold hands to in a romantic comedy. Oh well. I’ll enjoy the pacing of the song while it lasts for a few more days of the sessions. The “Two of Us” rehearsals over, John searches for the words to “Across the Universe,” while George sneaks in a little bit of Hear Me Lord. They go back into “Universe” for one take before attention shifts to “All Things Must Pass” and “She Came in Through the Bathroom Window” to end the day. Fascinating as always. So many details to ponder… “But I don’t think you really know what that one is,” “You be the boss,” “Get through like 20 or 30 and no more.” Wow! Sadly, for me, the thing that made the biggest impression was George asking for a beer. Can’t blame him. I wonder how many beers were consumed during those sessions? I’ve always assumed the preference at the time was for “Mary Jane.” (Or, in J&Y’s case, “Henry the Horse.”) I’ve read and heard evidence that there was drinking the day George quit… can’t wait to find out!